Monarch Phaser-Strobe PB Kit Reliability Direct, Inc. Your Direct Source for Reliability, Maintenance, Test & Measurement! The Nova-Strobe pbx incorporates all the unique design features of the Nova-Strobe family and has an increased operating range of 30 to 50,00000 flashes per minute, the highest available. It also has true external Phase Shifting throughout the complete operating range, based on a reference signal from an external sensor. Use the slow motion mode (auto step) to view high speed events at user controlled speeds. Times 2 and divide by 2 push buttons allow easy checking for RPM harmonics and allow stop motion far beyond the 50,000 FPM limit. Store and recall up to 9 user selectable values. Last measurement memory, even with the power off. The Nova-Strobe pbx incorporates all the unique design features of the Nova-Strobe family and has an increased operating range of 30 to 50,00000 flashes per minute, the highest available. It also has true external Phase Shifting throughout the complete operating range, based on a reference signal from an external sensor. The pbx can multiply or divide the flash rate by two with the press of a button, quickly identifying the basic speed and harmonics. The unique digital adjustment knob of pbx can select the decade for adjustments, so coarse and fine adjustments of flash rates are made quickly and with significantly better resolution than competitive units. The memory feature of the pbx allows three frequencies to be stored in memory, accelerating measurements that require the use of several different flash rates which can be displayed in both flashes per minute or flashes per second. The pbx operates with internal rechargeable NiMH batteries. The strobe may be run continuously from AC mains using the included universal AC power supply/charger. 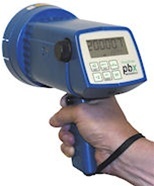 The pbx is compatible with Monarch's line of remote optical, magnetic, infrared and laser sensors. Flash rates from 30 to 50,000 flashes per minute, adjustable in 0.05 step increments, to 3,000 FPM and 0.5 step increments to 32,5000. The all digital, crystal controlled microprocessor keeps readings rock steady. Individual in and output TTL jacks provides power ro remote sensors and allows "daisy chaining" multiple strobes. Tachometer mode allows accurate speed measurement up to 250,000 RPM using external sensors. Dual-function delays in external mode. Delays adjustable as phase angle or time with resolution to 0.1 degree and 0.0001 seconds. Backlit alphanumeric LCD display shows flash rate in flashes per second or flashes per minute and delays in degrees or milliseconds. NIST Certificate of Calibration included.